Will Alton Towers recover from the Smiler crash? The Smiler accident at Alton Towers crippled its visitor numbers in the second half of last year. And as the park begins its seventh week of operation, attendances are still heavily down from those seen before the crash. The park has taken a number of measures to mitigate the subsequent loss in revenue, or resetting its cost base as park bosses prefer to call it. The most obvious is the fact that Alton Towers is remaining closed on some off-peak weekdays for the first time in recent memory. Dozens of redundancies were made prior to the start of this season, and a number of rides have been mothballed. The staff-heavy Nemesis Sub-Terra has been closed, as have two other indoor rides in the form of Hex and Charlie and the Chocolate Factory. 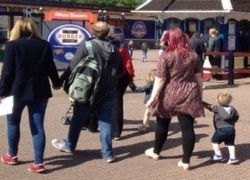 Alton Towers has created a programme of refurbishment – Towers Loving Care – to mitigate negativity surround the closures, which are certainly more due to cost savings as opposed to aesthetic improvements. The reality is that the people that are still coming to the park would almost certainly come if even more rides were closed in addition to those mentioned above, and also the Flume and Ripsaw, both permanently moved. These annual pass holders and other loyal visitors that return year after year are keeping the park ticking over as it looks to rebuilt its reputation in the long term. And that period of recovery may take a little longer than Merlin Entertainments chief executive Nick Varney has predicted. In a press conference last year he said that it was expected that the park’s visitor numbers would return to normal in 2017. Given the severely diminished crowds seen so far this season, there is a huge question mark over this claim. If, as it is believed, that the next major ride investment will now be delayed by a year to 2018, that is the very earliest we can expect to see visitation recover to any significant extent. The decision to delay – if confirmed – is another question mark over Merlin’s decision making processes. Where new rides are typically designed to expand – as well as maintain – visitation, Alton Towers’ next major investment should be seen as the only hope of bringing the park back to something resembling normality. The danger is that in the wake of reduced revenue and shareholder pressure, the next major ride investment somehow fails to capture the imagination needed to bring in the hundreds of thousands of people the park is badly missing.